for a baby due in June. The next two WINS were giveaways that ended up on my doorstep. on her blog from many vendors. 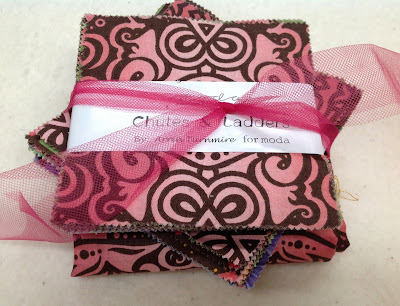 I was so lucky to the the winner for Christa Quilts. 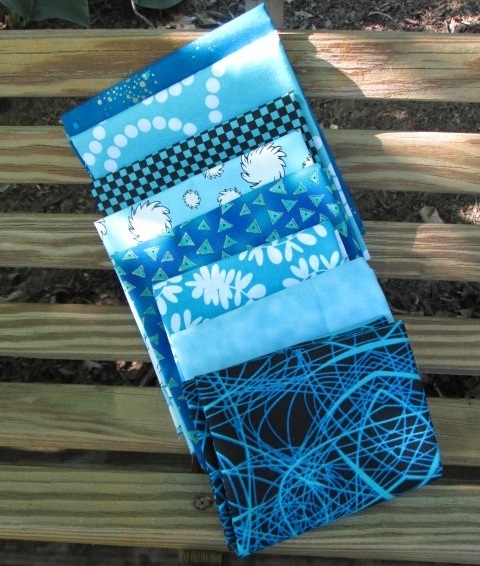 I picked out this bundle of wonderful FQ in blues. in the Sew Mama Sew Giveaway Day! Just in time to make something for the 4th of July! 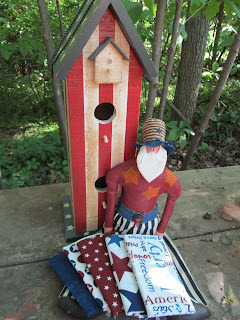 Uncle Sam might like a nice table runner to sit upon..
right now he's on my potting bench! And last but not least I was so pleased to see a post from my 300th GFC follower. Here is the post she wrote about the win on her blog. Say it with Flowers starts Monday and two extra days have been added. Who'da thunk it? 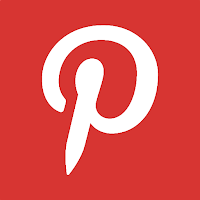 I am thrilled you think I have a blog worth following!! 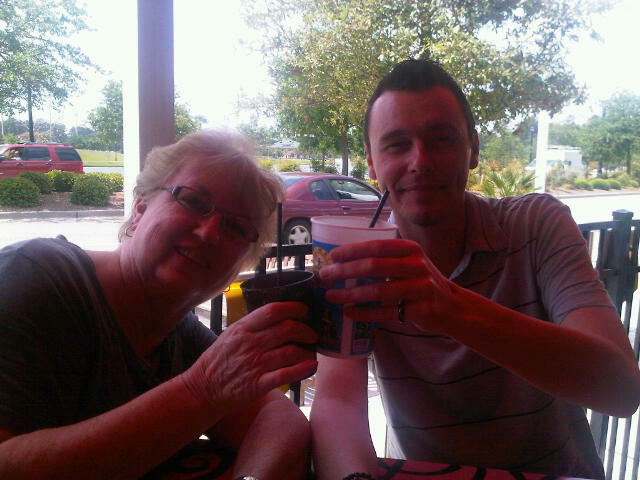 who thought about, but forgot to call me" on Mom's Day. 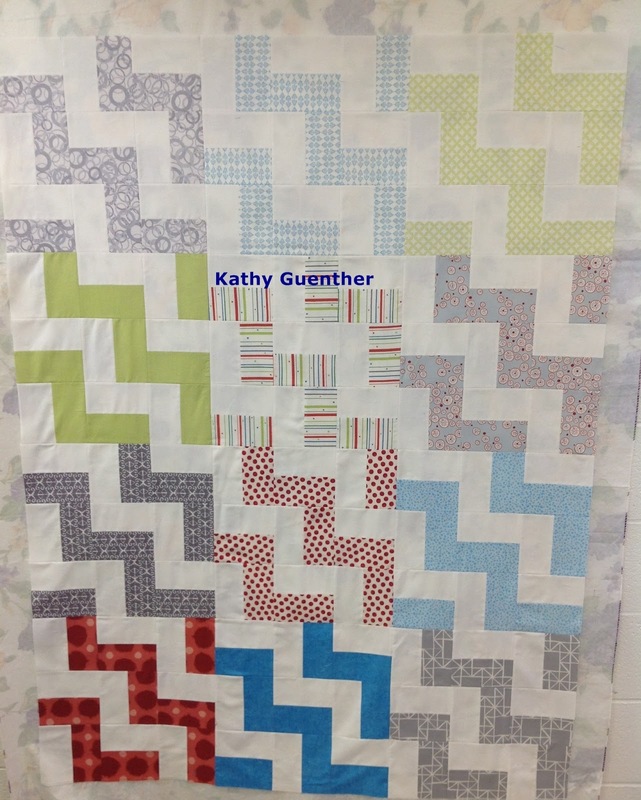 and any vote for my quilt is appreciated! in a fun rectangle design measuring 52 x 56"
Close up of the meandering quilting I did on my Bernina. The meander softens all the straight lines piecing. 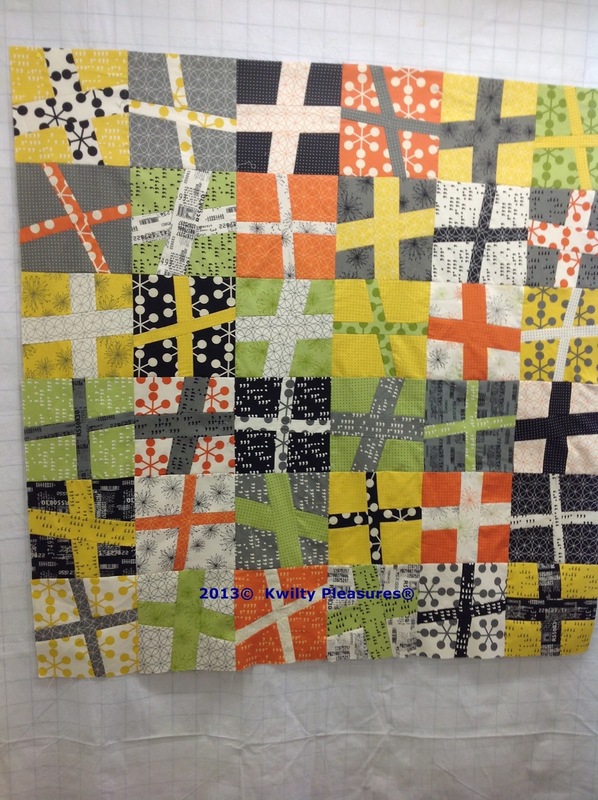 The "back" was fun to create using some leftover pieced blocks with a gray. Stacked view shows the dark gray binding. in the Ohio Land of OZ...Amish Country. nope not gonna get us. We are sewing, sewing sewing! I promised to show you the results..
a fun toddler quilt. Pattern is "Perfect 10" by Swirly Girls. my Zen Chic "COMMA" quilt. I had to let this one simmer a while before I sewed it together. I have more fabric at home to make it a big bigger. 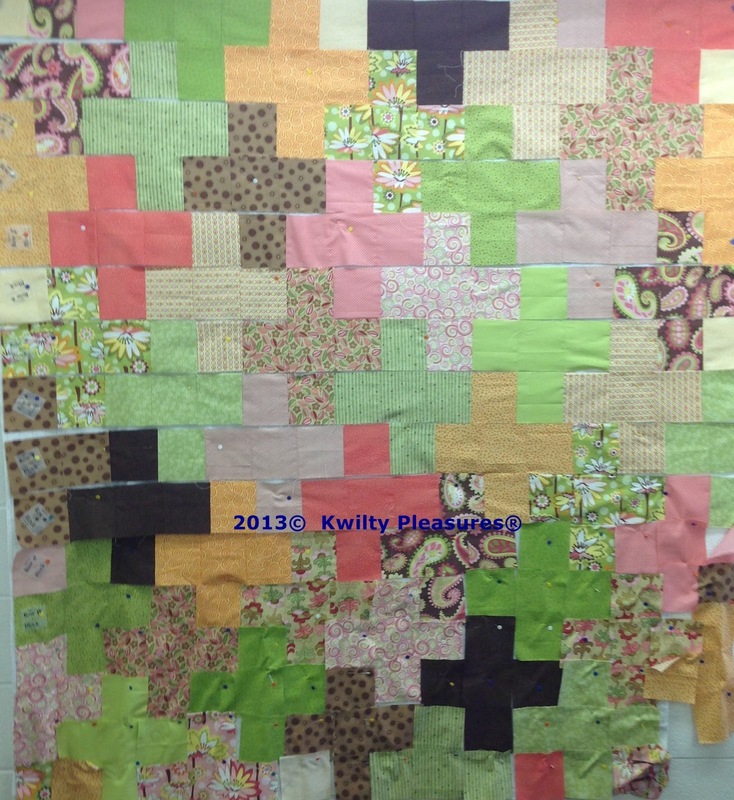 While COMMA was simmering...I worked on a "stash buster" baby quilt. 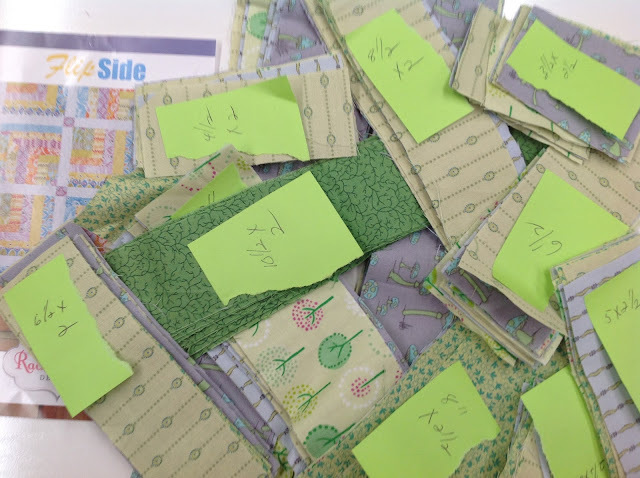 Sunday, I was charmed, working on a PLUS quilt. This process took much more time than I anticipated. the bottom rows to the design flannel...to be finished at home. or a pool tournament begins. 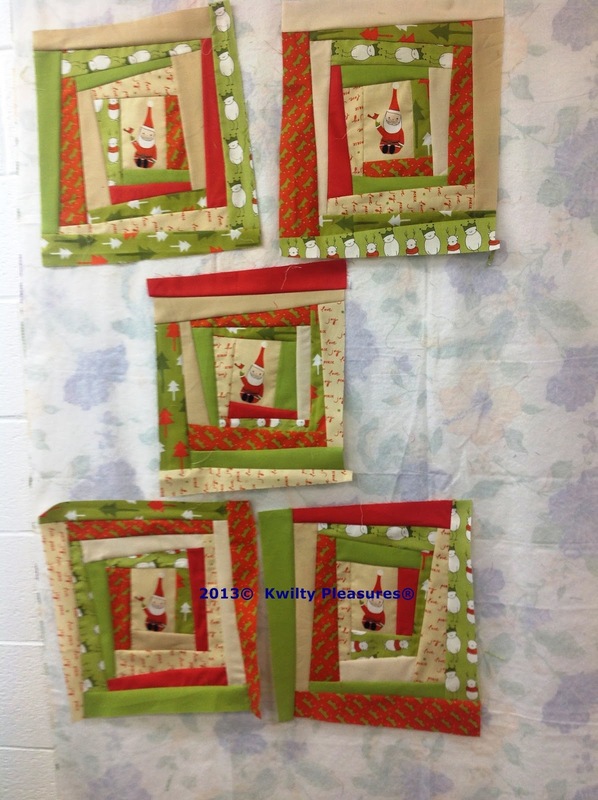 Next project... WONKY SANTA log cabin blocks. 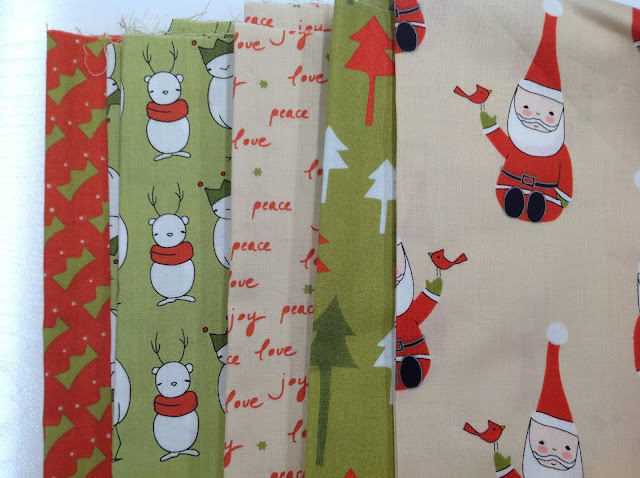 I fussy cut the Santa's and added wonky strips at random. THEN Jenny Janome began growling and snarling. She's never sewed so much in her little life! We were both worn out...time to pack it up!!! And I have to show you my quilting partner's work. This thoroughly MODERN MILLIE is something else. A perfectionist at heart but so inspiring. I think her quilt tops were the most photographed of the weekend! in Flea Market Fancy fabrics. And finally some shopping on the way home. A few fun things for my stash. I have a low volume quilt running thru my mind! I need to pop the DVD in and watch the movie again. Just call me Dorothy cause I am headed to the Land of OZ. In Ohio, that's Amish Country. Dorothy may think "there's no place like home" But I know better! 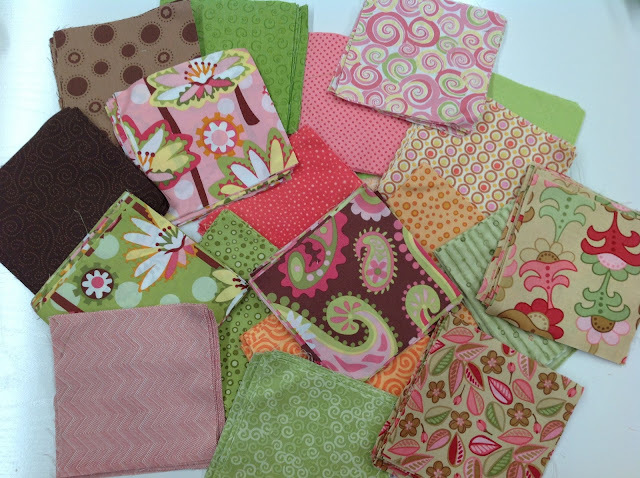 I'm meeting up with a great group of quilting munchkins for a quilting retreat. A long weekend of whatever we want to do...quilt, eat, shop, eat, chat, eat...you get the picture. in fabric form or perhaps in personalities of the fun quilters. are getting kicked off and I'm kickin back! The Great OZ, is Connie, the organizer of this retreat. She can't hide behind any curtain cause we will find her and thank her endlessly for such a great time. She does a wonderful job and makes a gift for everyone, provides discount coupons for the quilt shop, assigns us to our own 8 ft table to work on, organizes the food. Up next is a toddler quilt right off my design wall. 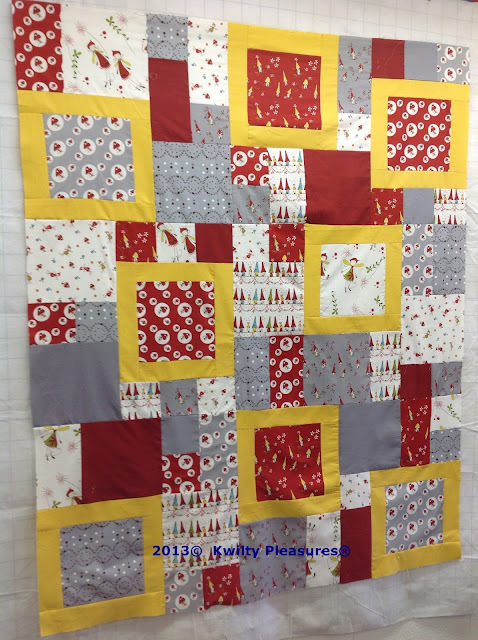 The Swirly Girl Designs Pattern "Perfect 10"
Next up, summertime FQs, pulled from my stash, to make my first Modern PLUS quilt, using Jeni Baker's pattern from her In Color Order blog. Click here to for the pattern. "Flip Side" is a fun pattern that looks like half a log cabin block. 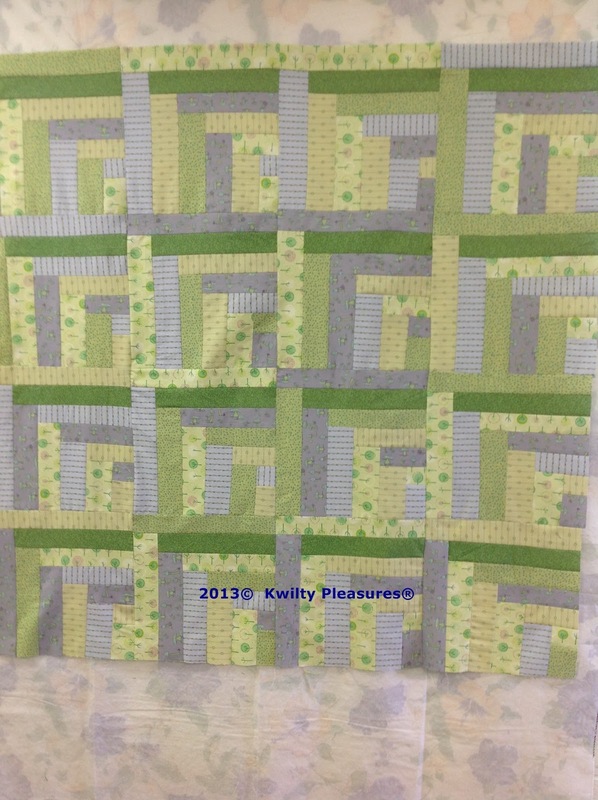 Using up lots of scraps in soft greens, blue and gray for a baby quilt. 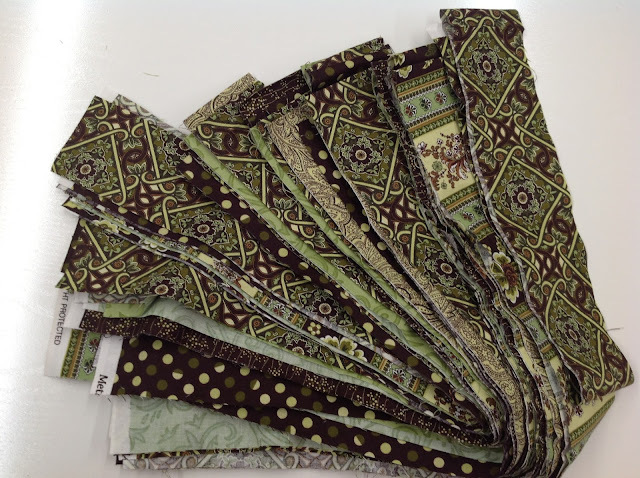 This stack of 2 1/2" strips is leftover fabric from a quilt I made a couple years ago. It's Michael Miller Metro Green. And if the Christmas Spirit hits me I have "Santa Claus is Coming to Town" by Andover for a wonky log cabin. The pattern is in Sunday Morning Quilts book. there's a house waiting to make a landing! 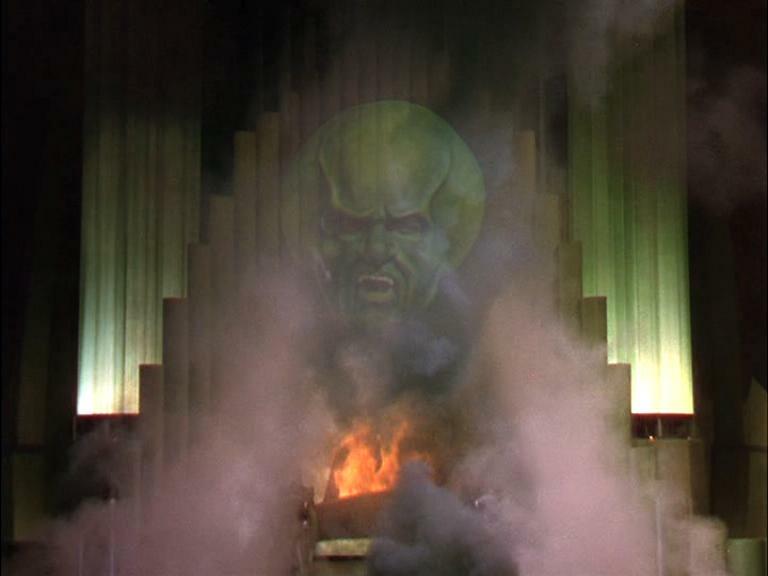 I will do a post to show you what Kwilty Pleasures ACTUALLY get done...in the Land of OZ! 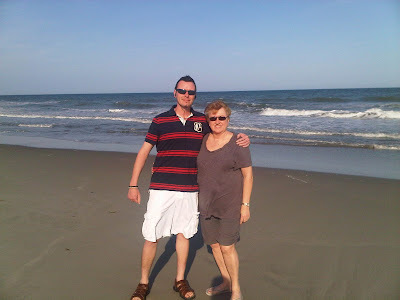 I was lucky to have Mom for many years. so I really lost her twice. a few photos and a few ways I got through my loss. 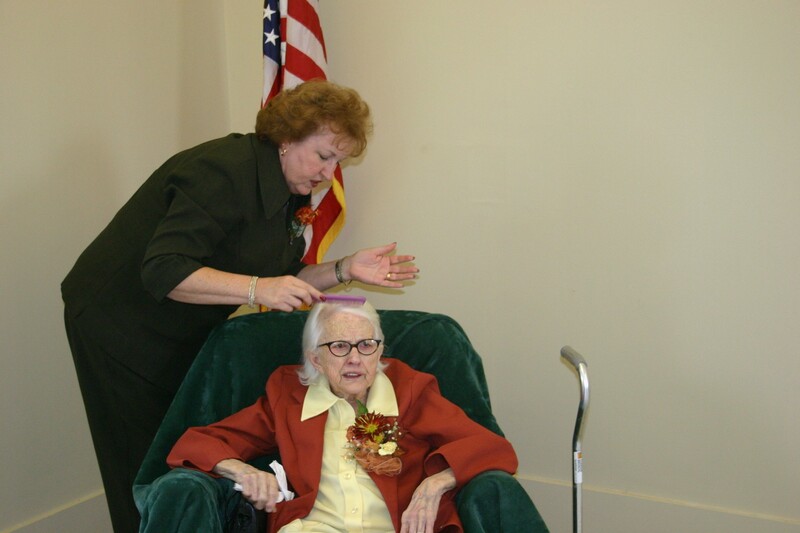 Here we are at her 92nd birthday, Oct 10, 2006. Looks like I was annoying her, as usual! Over 100 people stopped by to wish her a Happy Birthday. I'm probably annoying her again! And here she is a bit younger. 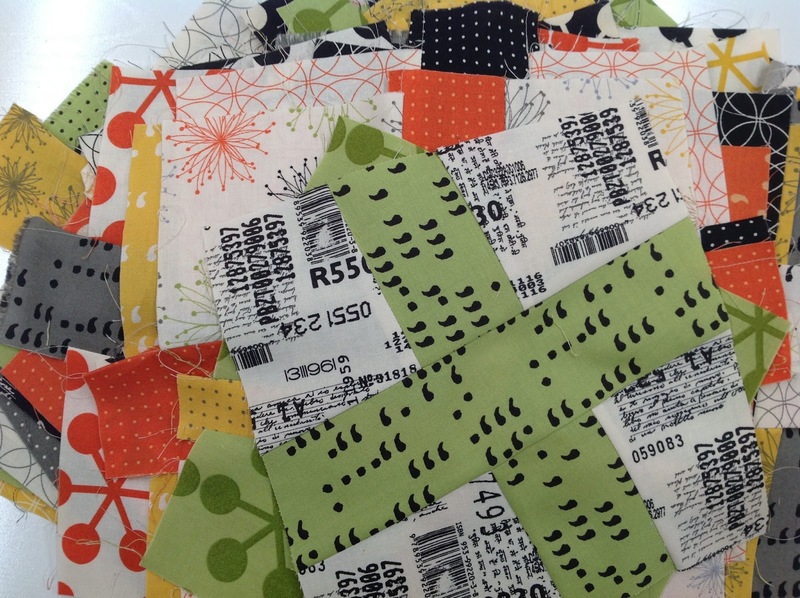 Mom was a quilter who hand pieced, scrappy quilts by sewing strips together. She was scrappy before scrappy was so popular. 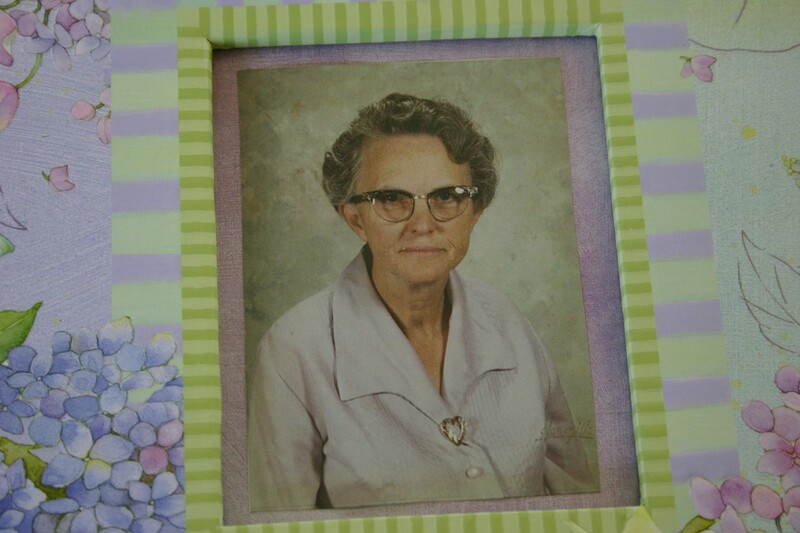 She made quilts for all her grandchildren. I just about lost my mind after loosing her, so I had to find a way to heal. I did it with fabric, the fabric from her clothes. 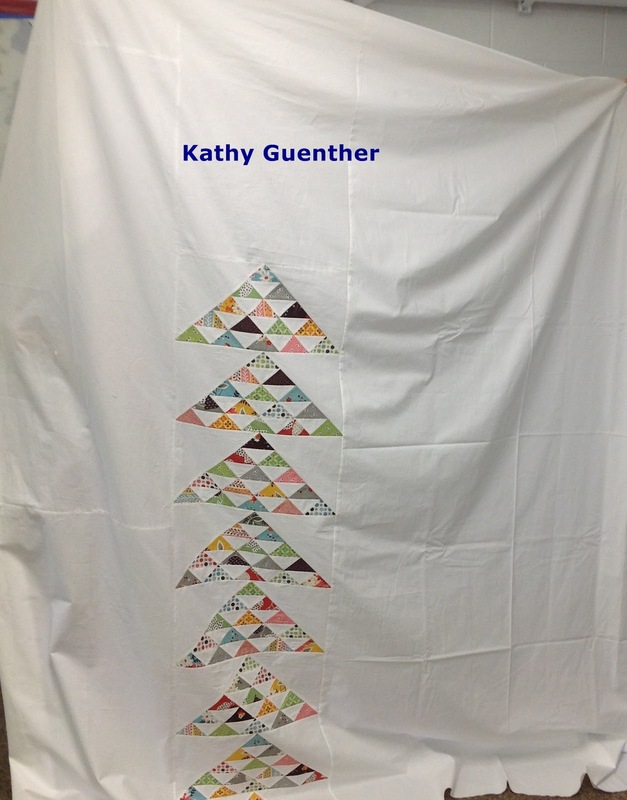 The first quilt I made was an applique quilt (and I knew very little about applique). I used her aprons that she wore EVERY Sunday when she made her family Sunday Dinner. She made the BEST fried chicken. YEP - Fried Chicken! I made this lap quilt - replica's of those aprons. just did a scrappy block design. in the 2010 Common Threads Guild Quilt Show. Mom would be so proud that I am a quilter and I made these quilts. BUT she'd be made as hell that I cut up her clothes to make them. Here I am with my son Eric, last Mother's Day, at the beach. He puts the Mom in my little world. 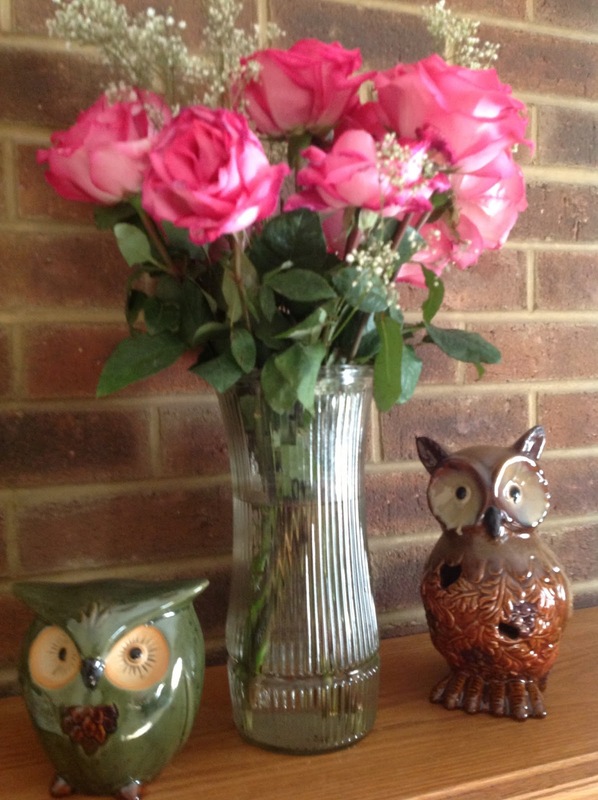 Wishing you all a Happy Mother's Day ! ! ! When Winning makes me MOODY! 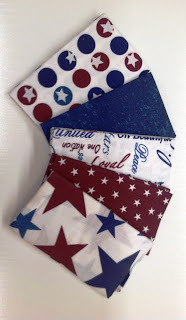 Just passed 300 GFC followers during the Sew Mama Sew Blog Hop! Jen Collins who lives in Australia! Jen a little "thank you" gift. 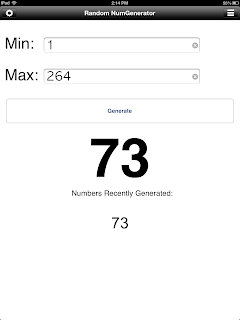 Soon, I will have a giveaway for ALL Followers. Coming soon I'll be "Saying it with Flowers"
in a blog hop sponsored by Sew We Quilt. 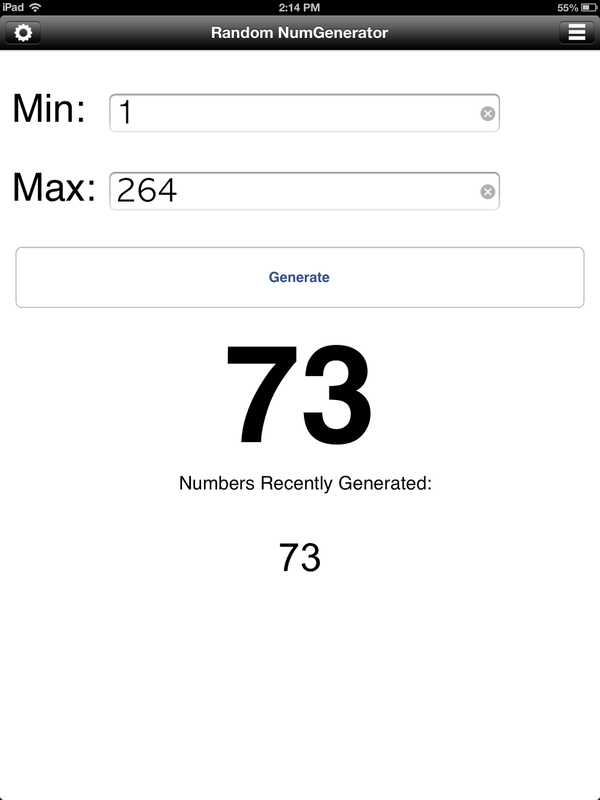 Perhaps another giveaway...you'll have to come and see! 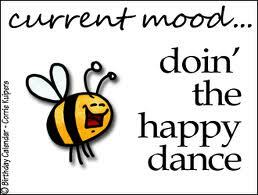 Because of you....I'm in a Kwilty Pleasures HAPPY MOOD! 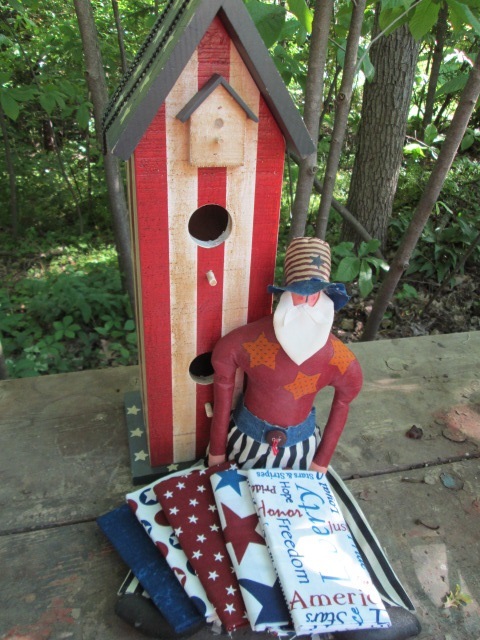 Hey, it's my day on "It's for the Birds" blog hop. I love watching the birds so this is a hop I couldn't resist. Each season brings lots of birdies to my feeders. So I "bagged" some cute birds" for my project! It's a quilt as you go styled bag! I used wonky sized strips for a modern feel. Love the double button closure! Lots of birds hanging out back! Look closely...lots of fun birds on this focus fabric! A pocket inside with even more birds on the lining! by the other bloggers today (and each day)! Hey, before you fly to coop....what is your favorite bird! 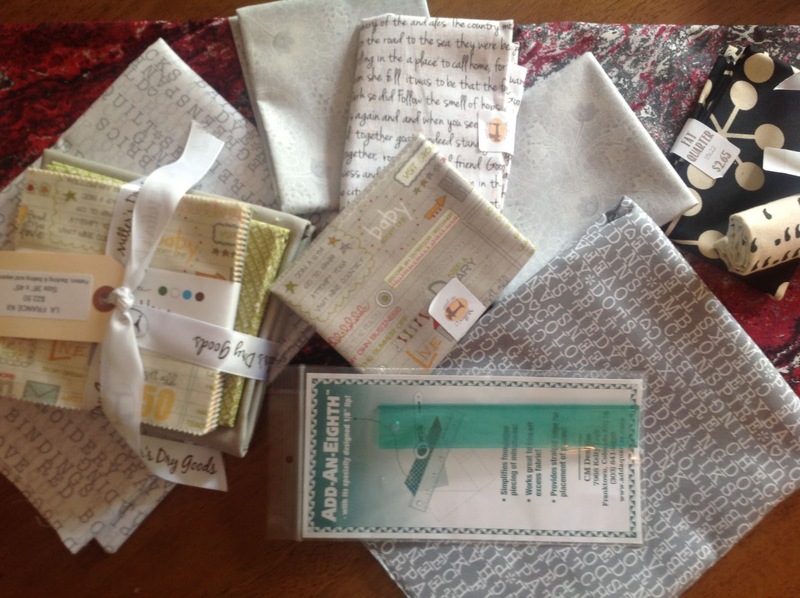 Sew Mama Sew Giveaway Day - Come play!